Click Customers >> 5 - Reporting Credit >> 1. Report to Credit Bureau. From there you will be able to enter your Program ID for the bureau you're reporting to. To report a customer's credit, the dealer must sign up with a credit reporting agency. Some credit bureaus require that a minimum number of customers be reported at a time. See Credit Reporting Agencies for more information. A program ID, or subscriber code, will be assigned to the dealer once signed up with the Credit Bureau. Enter the ID into the screen in the appropriate place (shown above). Frazer will assign the Credit Grantor ID that is also required. The format of this ID is FRZ followed by dealer name and dealer Frazer customer number. 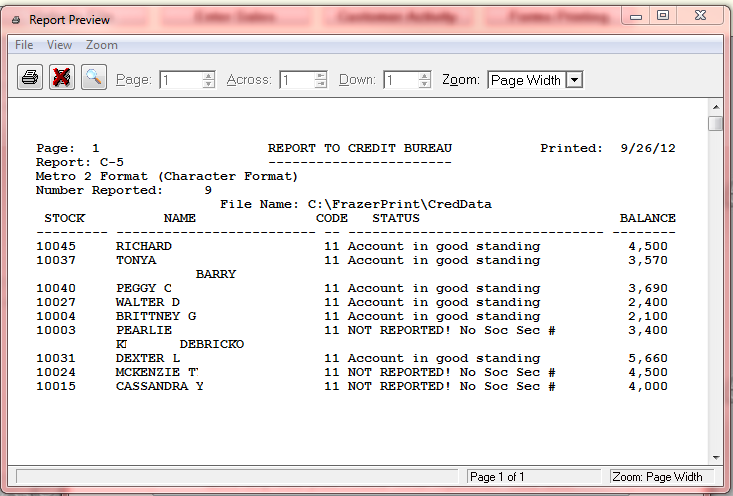 Once the above information is entered, and a location in which to save the file is chosen, Frazer will create the file needed to report customers to the Credit Bureau. The file is in the Metro 2 ® Format. Click on to generate the file. A print preview in a readable report format will appear on the screen. There are several standard account status codes. Go to Standard Account Status Codes to see a complete list. To change the status code for a specific customer, go to then the customer in question. Go to the tab for Credit Reporting/Bankruptcy. The Manual Credit Status may be overwritten here, if necessary. To report if a customer is in Bankruptcy or other information, go under the Consumer Information Indicator section. 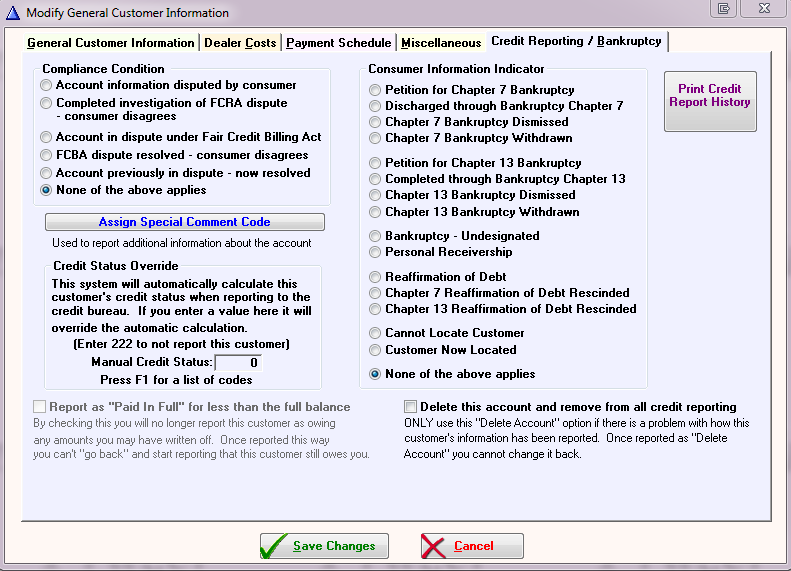 Anything changed in the Credit Reporting/Bankruptcy tab will update in the Metro 2 ® file the next time credit is reported. 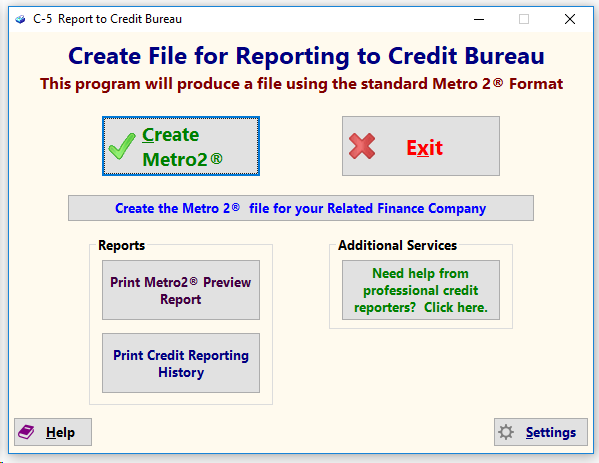 Once the Metro 2 ® is created, send it to the desired credit reporting agency. The agency will indicate how the file is to be sent to them. Account Status Code 96 is defined as “Merchandise was repossessed; there may be a balance due”. If the consumer redeems the repo, you should continue to report Account Status 96, but add Special Comment AZ (Redeemed or reinstated repossession). As payments are made, continue to report the same codes with a declining balance. When the account is paid in full, report Account Status 63 (Account paid in full, was a repossession) with Current Balance and Amount Past Due both equal to zero. Discontinue reporting the Special Comment AZ.